Regular health check up for pets are vital to safeguard them from infections and diseases. It allows you to implement effective treatments well ahead of time before the ailment gets worse. 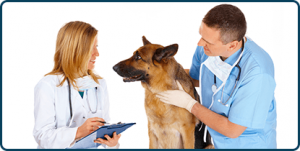 Pet health examination is the only way to ensure good health condition of your beloved dog/cat. Our veterinarians maintain a yearly health chart of the pets to determine the current health condition and catch the potential signs of any serious illness that can develop in near future. Wellness exams for pets must be undertaken in the early stages of life i.e. from first to 16 weeks. However, vaccinations prevent the chances of any disease or infections. But, periodic general check up will ensure healthy growth and lifestyle of your pets. Our veterinarians will undertake complete pet diagnosis to safeguard them from any severe illnesses. Parasites, worms, periodontal diseases, cancer and any other health issue can wreak havoc on your pet’s body. A periodic health check up will help a veterinarian rectify and address the health issues to improve the quality of life of your loved ones. The wellness exam becomes utmost important when your pet gets aged.It helps in identifying the various health issues that develop with age. Advanced diagnostic and an effective treatment play a significant role in prolonging your pet’s life. At Westheights Veterinary Hospital, we have a well-equipped in-house laboratory featuring important vet equipments. We undertake every pet disease analysis in-house for precise results. We provide you complete details of the entire check up along with the recommended treatments. Following is the list of wellness tests we perform in our animal hospital in Kitchener. At Westheights Veterinary Hospital, we ensure your pet leads a happy and healthy life. Our pet wellness exams are supervised by our veterinarians to minimize the possibility of developing any heart, kidney and bone disease. We just have the right skills to prolong your pet’s life. Contact us now to book an appointment and make the most of our veterinary services.